Keep an eye out for signs of tree stress in your garden. Some trees around the ACT, Yass and Bungendore region are showing signs of drought stress from an incredibly warm autumn and low rainfall for this time of year. Signs of tree stress include early leaf loss, wilting or scorched leaves, and little or no autumn colour in deciduous leaves. This can impact their performance next spring, their development and growth and make them more susceptible to disease. It’s particularly important to look after newly planted trees. What happens to trees in a drought? 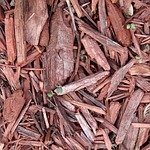 Mulch beneath your trees to retain moisture. About 50% of a tree’s living weight is water. When there’s less water in the soil the trees have less moisture to convert into glucose. This shortens the growing season and when heavily stressed the tree may go into winter dormancy. Slow, deep watering once a week over the entire root zone until your deciduous trees lose all their leaves. This means extend your watering out to the widest branches. If you put a cup under the sprinkler and wait till you collect 5cm you should have watered deep enough. For newly planted trees water every three days. When planting use water crystals which retain water to give new trees the best start. Mulch will help maintain your trees’ moisture. Spread around 5cm deep of mulch under the entire canopy of your tree. Keep it 3cm back from the trunk of the tree to prevent rotting. Click here for more information about mulch.